How to Edit Selfie To Look Nice and Professional. Step by Step Tutorial. Nowadays many women take selfies every day. But just some of them really look professional. 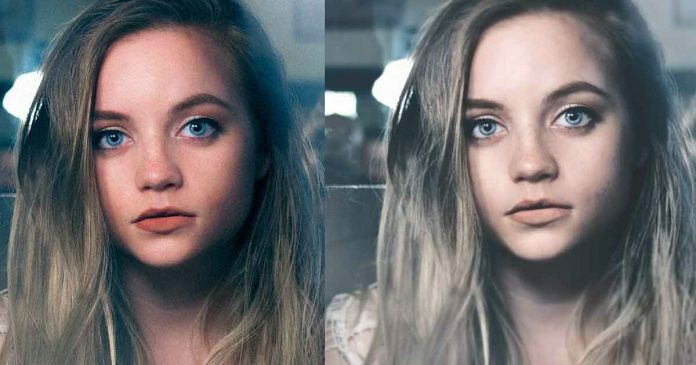 To make selfie outstanding you need to make an outstanding photo by itself, or you can use some editing tools like Photoshop to achieve the best result. 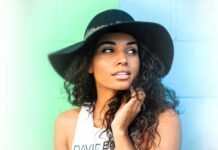 If you want to have your Instagram or Facebook profile memorable and stunning — this selfie editing step by step tutorial will help you to achieve that. Every holiday you make hundreds of phone caught moments. Unfortunately, not everybody is destined to have an eye-catching or patience to “play” with camera settings. 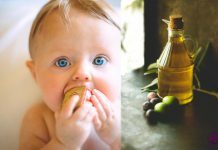 Still, even the most slippery photos can be sorted out – just install the right photo editing application and begin editing your precious selfie. How to Edit Selfie. Poses. 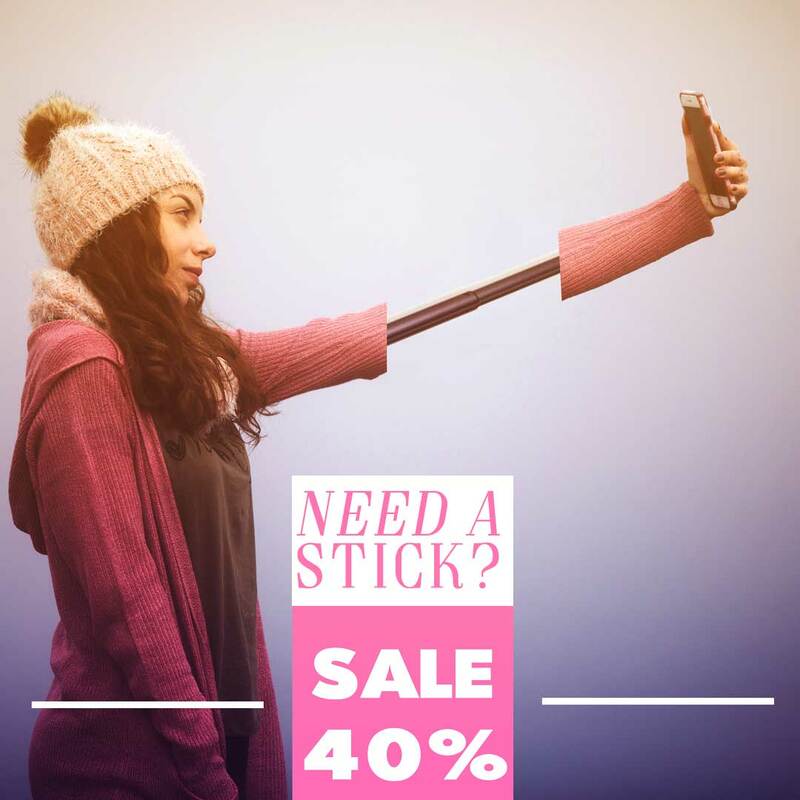 Need a Good Selfie Stick? 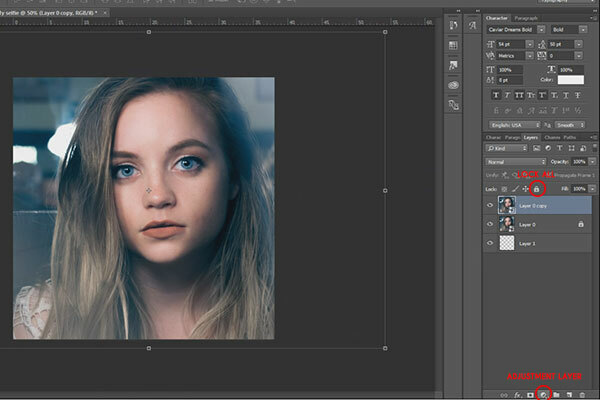 This tutorial will help you to edit your boring selfie into amazing art. All you need some basic photoshop and listening skills. Also, at the end of the article will put some workflows with the same method. Plus, I will edit the current image. So you can skip this step by step guide and go straight to the video. 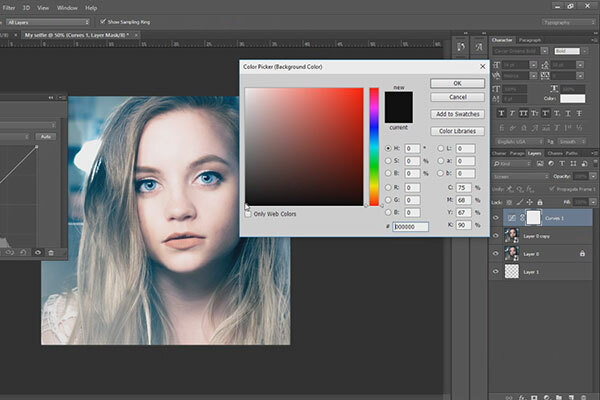 Sure, there are many alternatives for adobe photoshop, but this article not about alternatives (Anyway, it will be mentioned at the bottom of the article)Follow my lead. Focus on eyes, lips, nose, chins. 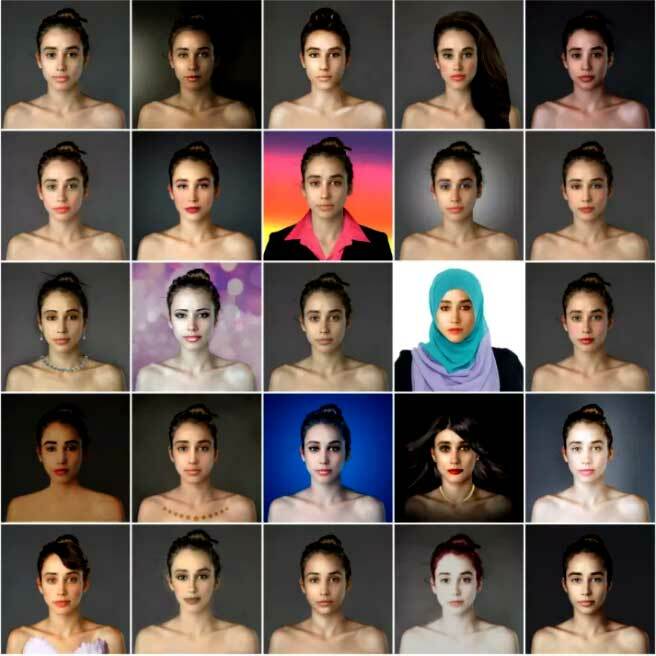 But remember, all cultures have a different understanding of beauty. For example. Most of the western countries people like to look at each other eyes and lips. That’s why there is not a global standard for photo editing, especially — selfie editing. But anyway, even in that image above, you can see, that main edited parts are eyes, lips, chins followed by hair, skin tone. The Best Selfie Edit APP? 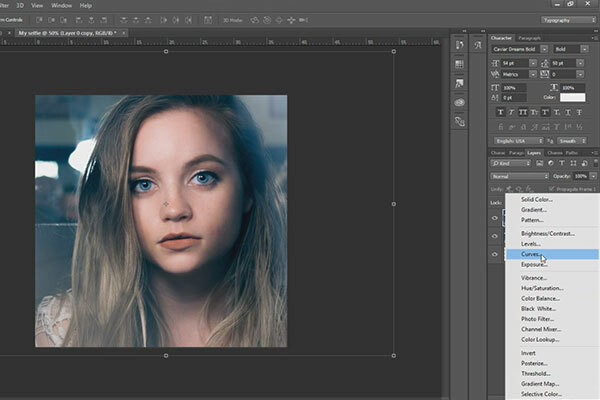 Well, I’m not Google, but the answer is simple — once again, best selfie editing app/software — Adobe Photoshop. So, forget apps, if you want to have a pro gallery in your social profiles or you want to print your beautiful photos. For newbies. Needless to say, that Photoshop is very powerful and most popular photo editing program around the world. Actually, it’s the Number 1 photo editing software. No Doubts. Yes, it’s paid software. But as the first timer, you can try it for free. There is a trial version. 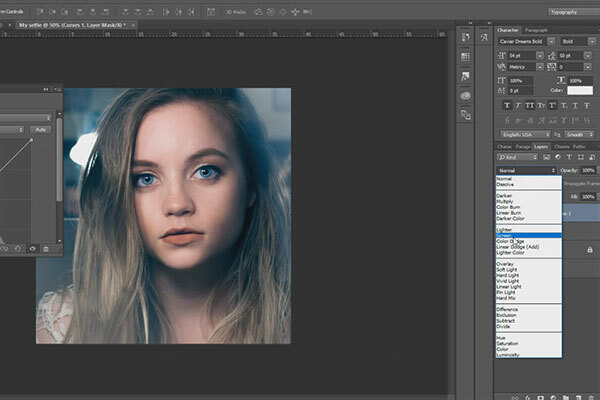 Let’s Begin Editing Your Cute Face. Preparing Selfie. For this selfie tutorial, I will use a random shot from Unsplash. (It’s a free source of amazing photos) I chose this photo because this bar environment looks like real life, so it will be very nice for editing. 1. 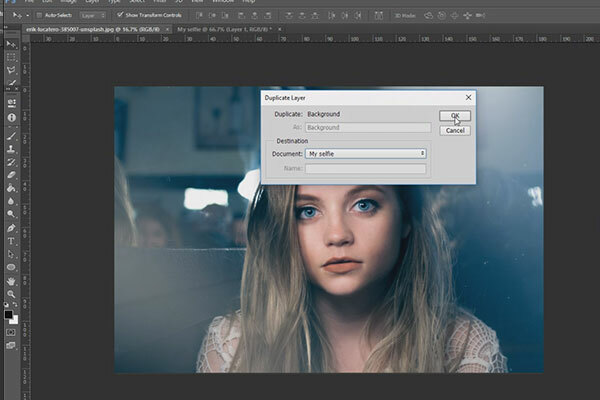 Open Your Selfie in Photoshop. Your phone cameras making very big files way bigger than needed. So we need to reduce file size keeping the same quality. Sure, you can edit your selfie in full size, but anyway, it will be reduced while uploading to your social networks. Sometimes they reduce size too much, that pictures look really bad. To avoid that just make a square image, that will be suitable everywhere. Follow parameters like in image 2. Instagram square image size is 1080px on 1080px, so we are using this image size as selfie edit standard. Image 1. After opening your selfie create a new file. Image 2. Make the image a perfect size for Instagram. Rename it. Go to view › new guide layout. 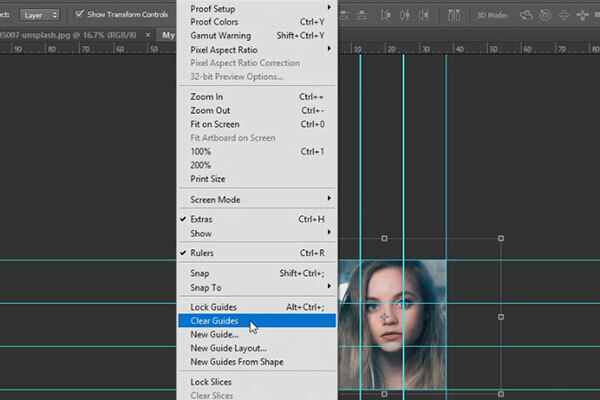 We create guide layout because we need to apply a very important thing in photography — rules of thirds. But You don’t need to think about it, when you are having fun and making random shots. Anyway, pro’s would recommend doing it. Image 3. 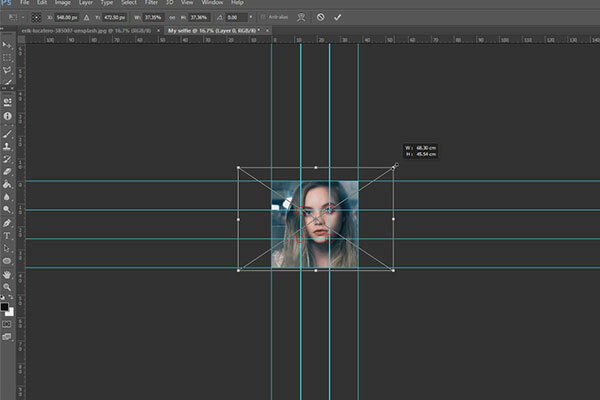 New guide layout to accomplish rule of thirds. 1.3. Guide layout with 3 rows and 3 columns. Create a new guide layout. It split rows and columns to equal parts automatically. Image 4. 3 columns and 3 rows. 1.4. Duplicate your original selfie to our new made document with guide layout. Image 5. Duplicate the main selfie to document You’ve just created. 1.5. Adjust image, that it fits the rule of thirds. Hold ”shift” key and using mouse adjust to the position you want. Image 6. Hold “shift” and using mouse adjust selfie that focus points fits in the red circles. 2. Begin to Edit Selfie. Let’s begin to edit selfie. At first, duplicate the main picture using CTRL+J (PC) CMD+J (Mac). Lock the first layer in case you will make mash everything later on. Then create a new adjustment layer called Curves. See image below. 2.1. Locking and duplicating the main selfie. Lock the main selfie using “Lock” icon. We are doing it, because by mistake we can mess everything later. Image 8. Lock first layer. Image 7. 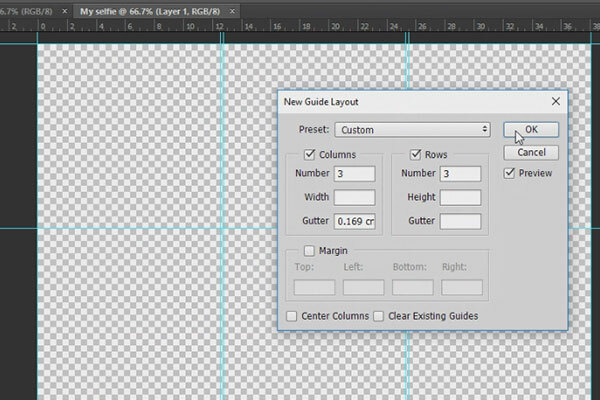 Create new fill or adjustment layer. Select Curves. Choose blending mode as screen. Image 9. Set blending mode as screen. 2.4. Making layer mask black. Click on the curves mask and using “CTRL”+”BACKSPACE” change curves background from white to black. Image 10. Change curves background from white to black. 2.5. Adjusting brush size and opacity. Using “[” and “]” you can adjust brush size you want. Brush opacity around 10-30%. I would not recommend to use more than 40%. 2.7. Softly brush market spots. 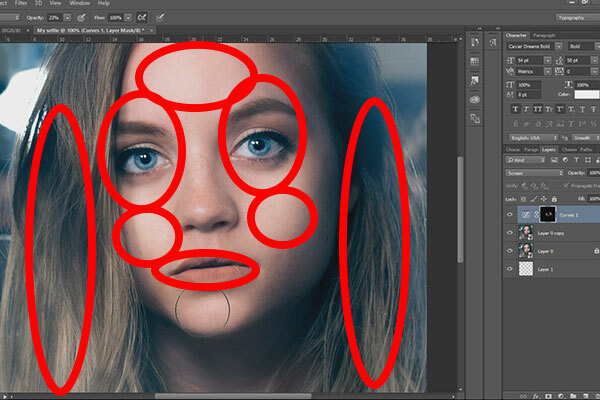 So using brush tool highlight selfie areas I’ve mentioned in the beginning of the article. In this case, eyes are the most important part. Do not overdose this effect because after this selfie edit your image would look like a doll edit. Image 12. 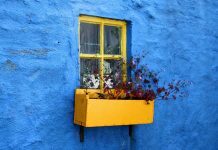 Brighten market areas. 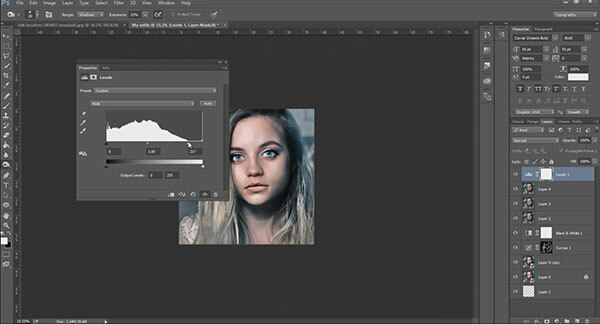 Make a new black and white adjustment layer. Make it on multiply mode. Image 13. 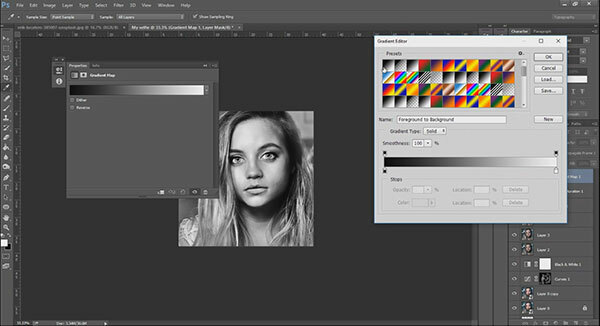 Make a new black and white adjustment layer. Make it on multiply mode. Using CTRL+ALT+SHIFT+E make a new layer. 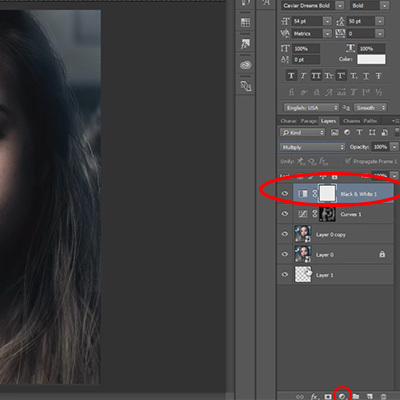 Then go to Image›Adjustments›Shadows/Highlights. Play with the amount of shadows. Do not make more than 60%, selfie will look unnatural. Highlights leave as it is. Hit OK.
4. New layer. Dodge and burn. 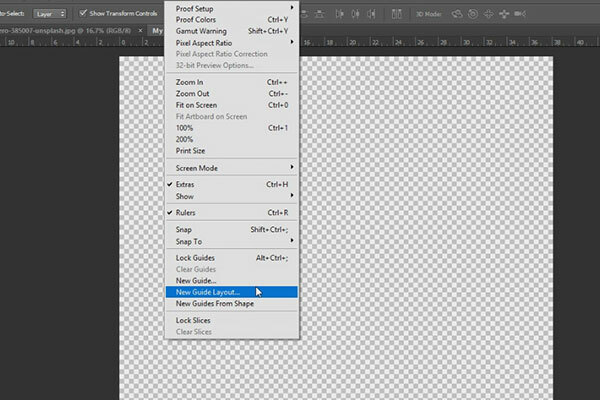 Create a new layer using Using CTRL+ALT+SHIFT+E. 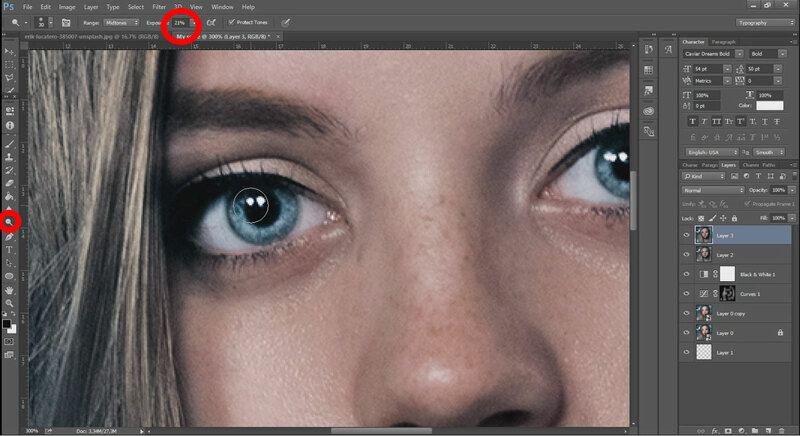 Using the dodge tool brighten the same areas as you did in 2.7. step. Make exposure 10 to 30. Image 15. Use dodge tool. 5. New layer. Unsharp Mask. 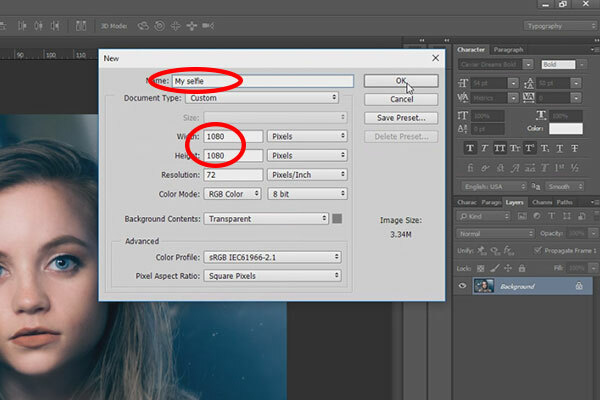 Create a new layer using Using CTRL+ALT+SHIFT+E. Go to Filter›Sharpen›Unsharp Mask. 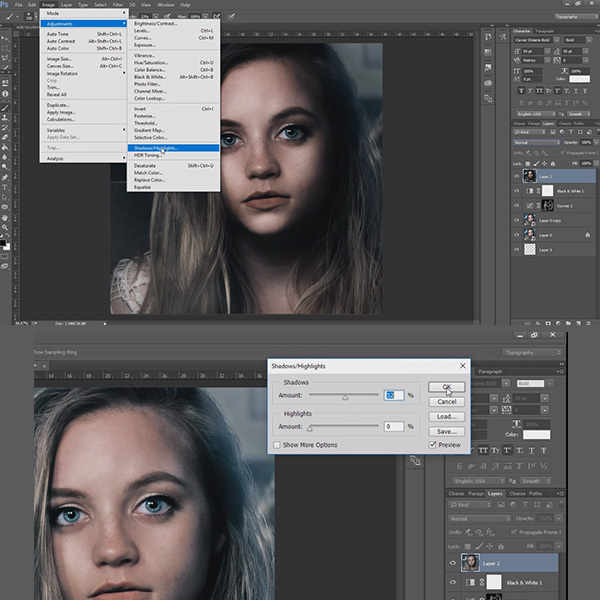 Create a new layer using CTRL+ALT+SHIFT+E. New adjustment layer. Levels. Play a little with levels bars. Every photo is different, so you need to check which settings is best for you. 7. New layer. Gradient map. 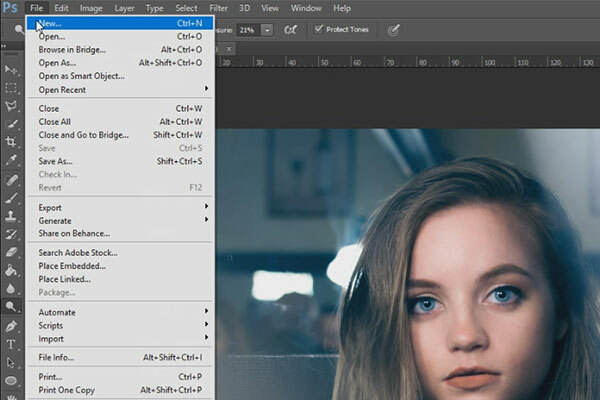 Create a new layer using CTRL+ALT+SHIFT+E. 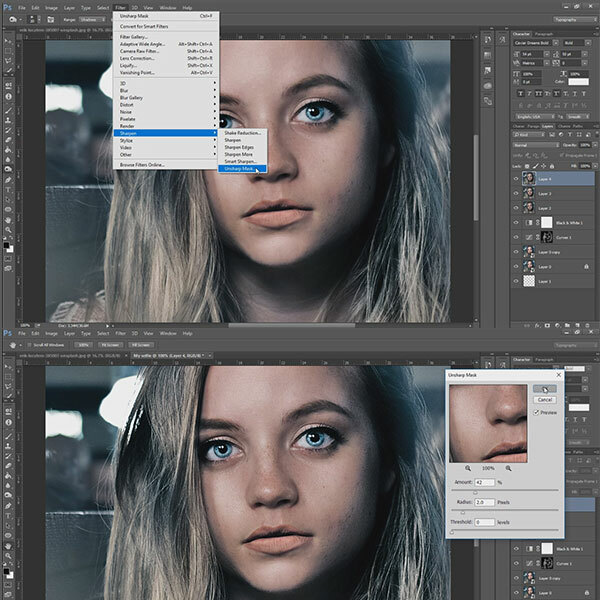 New adjustment layer › gradient map. Choose black to white gradient. (You can experiment with other colors). 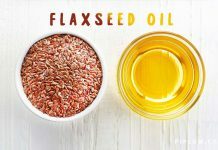 Make blending mode as soft light. You can try adding one more gradient map using the same actions. Just play with it. Before and after the selfie edition. My last tips: Do not overdose effects, because selfie will look terrible. Always remember to credit authors, because hard work should be appreciated. If you like this selfie tutorial, share it! 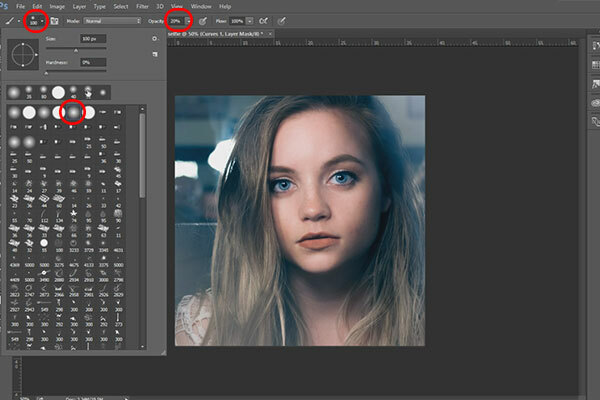 Welcome to the world of photoshop! Previous articleOrange Sunset in the City Palanga.